That's it on the right, next to their earlier snotty dictatorial attempt at public relations. 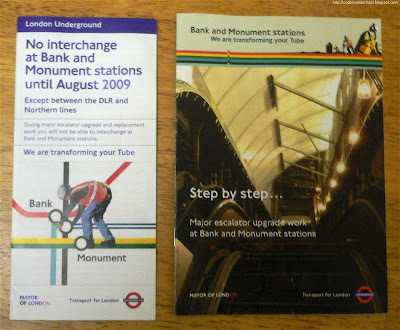 They've managed to produce a nice, well-illustrated, detailed look at the history of Bank and Monument and a reasonably detailed overview of the escalator refurbishment programme*. It's informative, relevant, well-written and borders on being friendly in places. It doesn't even contain any outright lies. To minimise disruption we are endeavouring to keep as many walking routes as possible through the stations open. We apologise for any inconvenience caused to your journey. Disingenuous or not, there wasn't anything even resembling an apology before.